Fun and frivolity or blood and guts? Just one year until the 2012 Olympic games will be played in London. To mark the occasion the museum of London hosted gladiator games at guildhall, where a real Roman amphitheatre lies beneath the current courtyard. 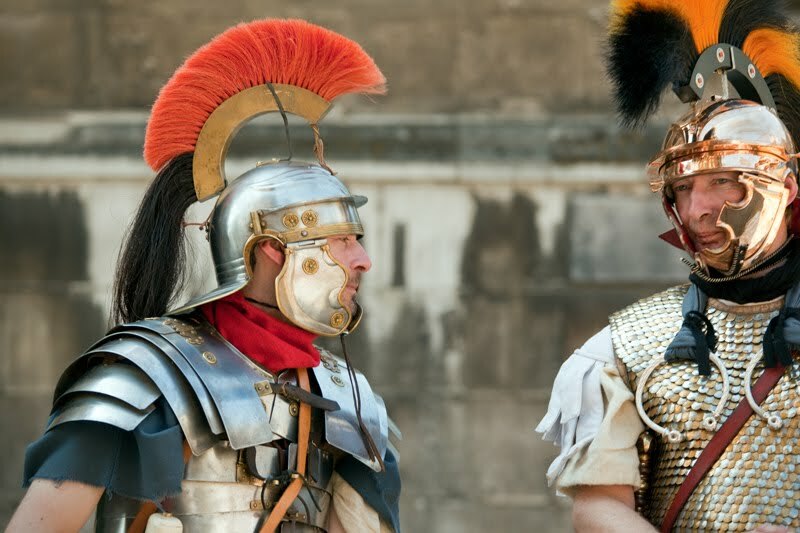 The gladiators are in two teams, Londinium and Camulodunum – London and Colchester. We have learnt how to shout for mercy or demand death to the losing gladiator. It is rather scary how often we demand death. Who knew men in shiny helmets would have me so excited! Sounds exciting to go back in time this way. You can imagine a bit how people lived their lives. Mo, I didn't expect the blood lust from you. Fun foto find! Love their armor and what a cool photo! Good looking men while wearing helmet. Love the BBC spoof '2012'. Great costumes, they're better even than the ones I saw the 'Gladiators' wearing outside the colosseum in Rome! While no gore to be seen it does give the flavour of Roman attitudes, and the human state! If real gladiators were allowed today they would be a huge draw. COOL!I WISH WILL BE THERE NEXT YEAR! Great title for a great portrait. I wish I could be there to watch the gladiator games. This is a lot better than the real thing in the ancient time, because there is no real blood and guts.